The interior of Newport Parish is composed of little that is actually colonial as well as a conglomeration of objects and mismatched features of questionable authority. This church is less of a room church as Upton describes it than a semi-gothic space with a separated entrance and chancel that gives it a medieval character instead of a colonial one. Compare the effect of the huge windows at churches such as Abingdon to see the difference. I am reminded of the practice of suddenly opening side windows at services in the Williamsburg Presbyterian Church that always surprises me with the suffusion of light at the end of the rituals. All that remains of the original interior woodwork is part of the architrave over the entrance door and one of the balusters on the alter rail from which the other balusters were copied (Rawlings 34). The roof uses massive tie beams to support the rafter surface that enclose the space in a manner reminiscent of medieval structures. Some of the window sills and plaster may be colonial (Rawlings 34). There was clearly a rood screen, unlike almost all of Virginia’s churches, and the bench pews may have been reconstructed in the nineteenth century from original ones (Rawlings 35). The box pews to the west of the altar screen are reconstructions of those constructed for wives of local officials (Rawlings 35). The rest of the pews are simple slip pews that may be derived from the original pews. Were they cut down like those of Vauter’s parish? The pulpit on the south wall is reconstructed from original models in other churches; the only original piece is reputed to be the sounding board (Rawlings 35). I didn’t think to catalogue all of the items, but, if the church was built in the 1680s, many are of dubious authenticity. All in all, the effect of the interior is charming and gothic, almost like a transplanted English church. The light though the windows is muted by the deeply colored windows and makes it dim and moody rather than open, airy and luminescent as seems to be the effect in the room church in its full development (consider Merchant’s Hope). I do not go so far as Rawlings who asserts that “…it must reluctantly acknowledged that several false steps have been taken, and it is to be hoped that other colonial churches of great significance will not err in the same ways in the future (37). It is an important building, and it is to be hoped that future research will reveal more concrete information about the architecture, the dating, and the original interior. A set of dating bricks, discovered in a roof collapse in 1887 (Rawlings 8) or 1886 (Meade 193), bear the date 1632. 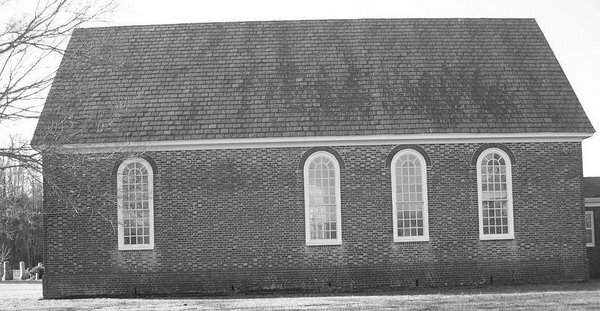 Architectural elements such as buttresses, crow step gables, and the principal rafter roof were characteristic of early 17th century churches (Upton 60-61). It was common for several churches to be built on the same site generations apart. The presence of a brick church on this site does not mean that it was this brick church. On the contrary, according to the guide with whom we toured the church, no evidence has been found of other church foundations on the site (as in Bruton Parish for which there is clear documentary and archaeological evidence of previous churches.) (King 2007 interview with tour guide). Joseph Bridger was born in 1628 and was four years old in 1632. Some sources (Meade 206ff and Mason 1994ff) cite clumsy efforts to link Bridger’s father with the site, but his name was Samuel, and he can not be documented as having come to America. The bricks have indeterminate numerals that can be read as 1632 or 1682, and the style of numerals does not match colonial scripts. According to Upton (1985) the bricks are clearly forgeries. 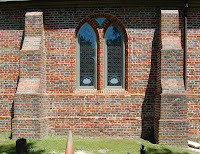 The bricks also have a mortar coating indicating that they may have been re-used as interior bricks in later repairs, alterations, or new construction. Two other local figures, Charles and Thomas Driver, are also associated with the church, but they, like Colonel Bridger, are associated with records in the later 17th century when they were adults. There are two bricks in the third story of the tower bearing the initials CD and TD usually associated with these two men (Rawlings 8). The architectural features of the building can all be documented in English churches of the later 17th century or much later time periods (Upton 83ff). It is unlikely that one of these buildings predates the other by fifty years or more. The population of Isle of Wight was 31 people after the uprising of 1622 and 522 in 1634. The cost of such a church was approximately 100,000 pounds of tobacco paid for by tax levies three years before construction began. This would entail a tax of 60 pounds of tobacco per year if the figure 522 represents tithables only and 120 pounds if half of the population consisted of tithables when the average tax was considered a burden at 20 pounds per tithable. The average tax was 20 pounds of tobacco for the colonial government and the same for parish taxes. It seems unlikely that the population could bear, in the best case, double taxes, or, in the worst case, quadruple taxes (Rawlings 8; Upton 60; figures King). Funding for the Jamestown church of 1639 was such a problem that it took eight years to complete the church. Could a more elaborate building have been constructed in 1632 in a sparsely populated county such as Isle of Wight? A compromise theory that the church was begun in the 1630s and then modified fifty years later, resulting in the current edifice is also posited. According to the guide who gave me the information, there is no physical evidence of multiple building times (King interview with tour guide). My personal view is that it is most likely that the church was constructed in the 1680s on the general site of an earlier church, possibly one with brick foundations under wooden walls. The assertion of 1632 construction is predicated on dubious evidence and is not accepted by dispassionate authorities who have no particular viewpoint to advance. Occam’s Razor, or the rule of simplicity in drawing conclusions, states that of multiple theories to explain an event, the one that is simplest and agrees with most data is likely the correct one. I would like to hear from those who disagree with me so that I can post their comments. Like them, I await archaeological evidence to clear up the dating. 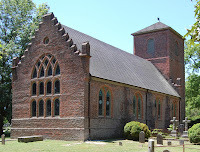 Newport Parish church, locally called St. Luke’s Church or the Old Brick Church, is an architectural oddity and undoubtedly the oldest Gothic structure and the oldest Anglican church in the United States. The date of erection is a matter of debate between academics and local tradition and will be covered in another entry. The basic church is 60’6” x 24’3”, basically the standard size of the average Virginia liturgical edifice. The brickwork is 3’ thick at the foundation and 26” thick in the walls. There are three buttresses on the north and south walls with a Gothic shaped window located between each one. The water table is unique: I didn’t measure the height, but there are two of them instead of one – each about 2 1/2 feet high (?). There are numerous repairs to the brickwork on the walls, and there seems to be mixed bond: We noted basically Flemish bond with English bond on the buttresses, although there seem to be patches of mixed brickwork. 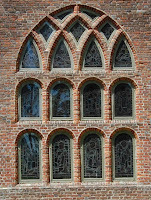 Features such as the gables and windows show evidence of repointings at a number of locations. The gables have eight steps and superficially resemble those at Bacon’s Castle. The repairs and alterations are not surprising as the church was abandoned after the Revolution and the roof is reported to have collapsed during a thunder storm in 1887, revealing a dated brick. The bell tower stands on the west wall, is three stories high, and was built as an integral part of the church. Its dimensions are 18’ east-west by 20’ north-south. There is a round, brick arch under a simple triangular pediment as the western entranceway leading to a replica of Yeocomico’s wicket door as the church’s entrance. The pediment over the arch is articulated by raised brick decoration and the interior of the triangle is filled with flat white plaster. On the north and south sides are oval openings three feet wide (I didn’t measure). The corners of the tower are decorated with brick quoins and between the two stories are a horizontal row of brickwork dividing them. Note that the quoins are smaller on the third story. There are green, shuttered windows on the outfacing windows and a triangular cornice surmounted by a weather vane.